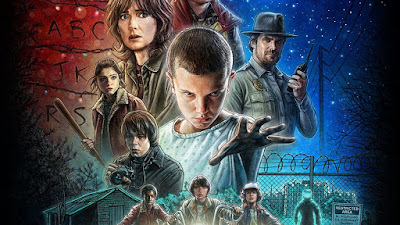 I discovered the Netflix Original show, Stranger Things, that has now been all the rage online recently and watched the entire season in a few days. In case you are living under a rock and haven't heard of it, I thought I would post about how wonderfully nostalgic it is. The boys are your typical geek squad that are absorbed in their little world of after school shenanigans and nerding out over the cool things a favorite teacher exposes them too. I won't include any spoilers but let's just say that there are creatures and darkness that play into the show which has it's frightening moments at times. There is also a couple of awkward love stories that are introduced which have all the cheesiness of a proper 80's film. If you haven't checked it out, I suggest you do. And if Netflix could put up another season for me to binge watch, that would be awesome, k, thanks.